Well, over the last few days, I have been installing the workbench and some overhead cupboards, and I’m quite pleased with the end result. I have installed 2 x 28W ‘daylight’ fluro tubes over the bench, behind a valance. This type of tube was chosen because it’s the colour temperature of the lights on Bowen Creek, as well as what I plan to use on the home layout. This allows me to carry out weathering tasks under the same lighting conditions as on the layout. Now I can finally start to unpack some of the modelling stuff that has been in boxes for nearly two years!! I am really looking forward to getting back into the modelling, now that I have a place to do it. The first priority is to complete some weathering of wagons in readiness for the Epping show which is now under three weeks away. Andrew and I have also been playing around with our recently purchased Loksound Programmer and decoders, but I am having problems uploading sounds to the decoder. Does anyone out there use Loksound and program their own sounds? Well, over the last week I have been busy finishing off skirting and architraves, and yesterday the room was cleared out ready for the carpet, which went down today and the room looks great. The two shots show ‘before’ and ‘after’ the carpet was laid. On Sunday, Andrew is bringing up ‘Bowen Creek’ to erect in the room so we can do some testing prior to the Epping show in June. It will be interesting to see how the modules look in the room, because BC’s height is pretty much what the average height that ‘Liverpool Range’ will be. A few weeks ago, I also managed to print off some full size track plans of the storage sidings, Ardglen, Kankool and Pangela on the plotter at work. I’m going to lay them out on the carpet to get an idea of how things will look. So, the next job is to get the modelling bench up and the final LED room lights so I can fit the missing ceiling panels. The ceiling is now complete, except for the panels where the downlights will go, but the rest is done. The carpet is booked in for 7 April, so between now and then, I have to clean up a bit, finish the door architraves and skirting, and empty the room. I will post some photos next week showing before and after the carpet. Well, since my last post, I’ve been busy continuing with the ceiling installation. 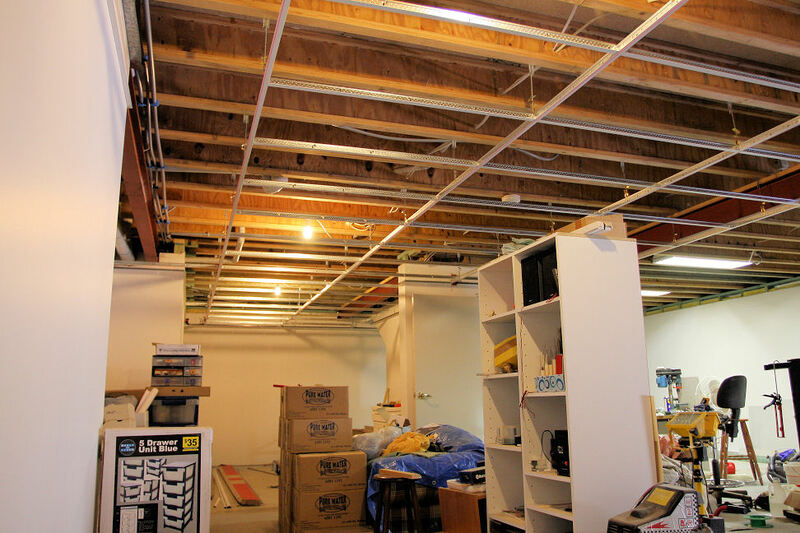 I completed the grid for about half the room, and then started installing the ceiling panels. The missing ones you can see are where I will cut future lights into the panels, so have not erected them yet. The last photo is of the modelling area where the new workbench will go, on the right hand side where the ceiling panels are stacked. All in all, I’m really pleased with how it’s all looking. I’ve got the plasterer lined up hopefully for this weekend to start on the final bit of joint setting around the roller door area. Once this is done, paint is next, then I’ll be able to continue with the rest of the ceiling. I’ve also decided on the flooring. Cheap carpet will be laid. I went shopping for carpet yesterday to three places here, and prices ranged from $2500 to $3000 for basically the same carpet!! So, off to the cheapest quote place tomorrow to arrange for them to come and do their measure and actual quote. So hopefully within the next month, ceiling will be complete and carpet down. Then comes the modelling bench!! Since the last post, I have managed to get rid of some of the crap out of the train room. A cupboard and steel shelving unit are now in the garden shed, and the other large cupboard I managed to sell to a mate at work. With these things out of the way, I have a bit more room to move around. 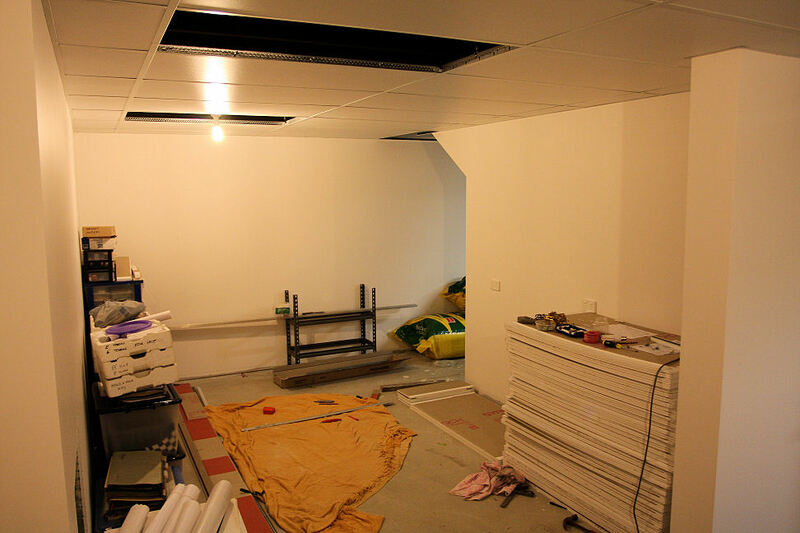 Over the last week, I started erecting the suspended ceiling, and now have the grid up in about half the room. Whilst the setting out takes a bit of time, the actual erection of the grid happens pretty quickly. I have also managed to roughly work out where I want the room lights. These will be switched separately to the layout lighting. I had drawn the ceiling grid up on CAD and overlaid it on the track plan, so it shouldn’t be too hard to place the lights. I am going to use LED downlights. We already have some up in the kitchen and they are pretty good. Not only do they save power, but they give a bright white light. I am also now leaning towards putting cheap carpet down on the floor in the train room. The carpet tiles I was looking at would certainly be easy to lay, but they don’t provide much in the way of comfort under foot. I have also completed the last bit of gyprocking over the roller door, so I just need to get the plasterer back to finish it off. Till the next update, hoo roo. Well, since the last post, I’ve had a plasterer in to set the joints and the walls now have had a coat of paint. I have been doing some electrical work too, installing GPO’s and light switches. I went into the local plasterboard supplier this arvo to look at suspended ceiling stuff. To do the 100 square metres or so will be about two grand worth of materials. That’s the next part of the project, to install the ceiling. 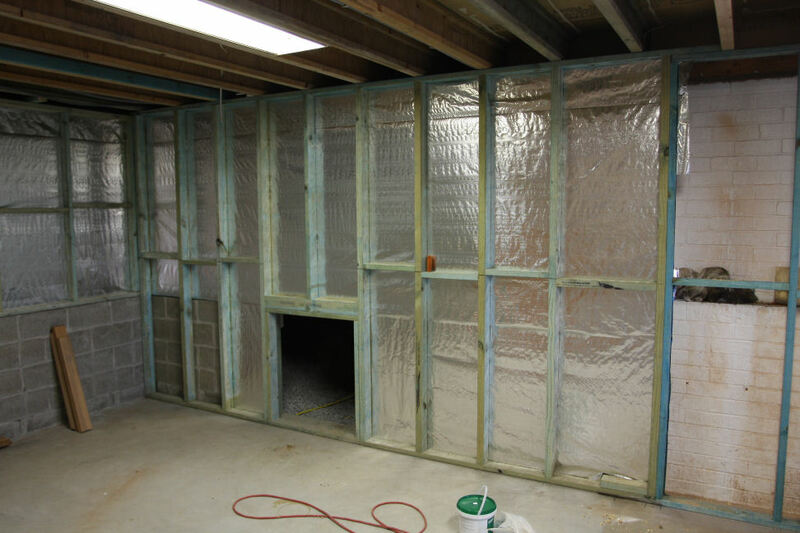 But before that happens, I want to order the materials, get them inside the room via the roller door, then finish this last section of framing/plastering. The room will then be sealed from the outside world. Then the ceiling will go up. 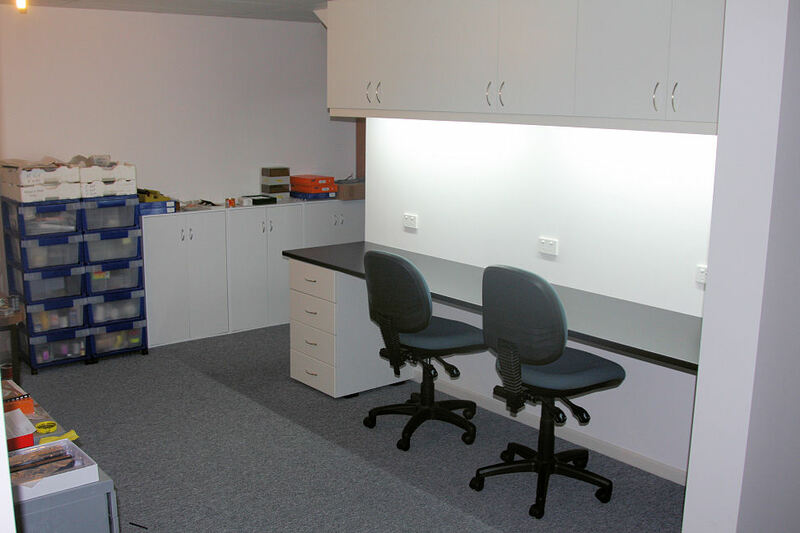 In the interim, I hope to get the modelling bench installed, and then I’ll be able to unpack some of the modelling gear. The next photos I post will probably be of the room with the ceiling up and all the crap out of the way!! 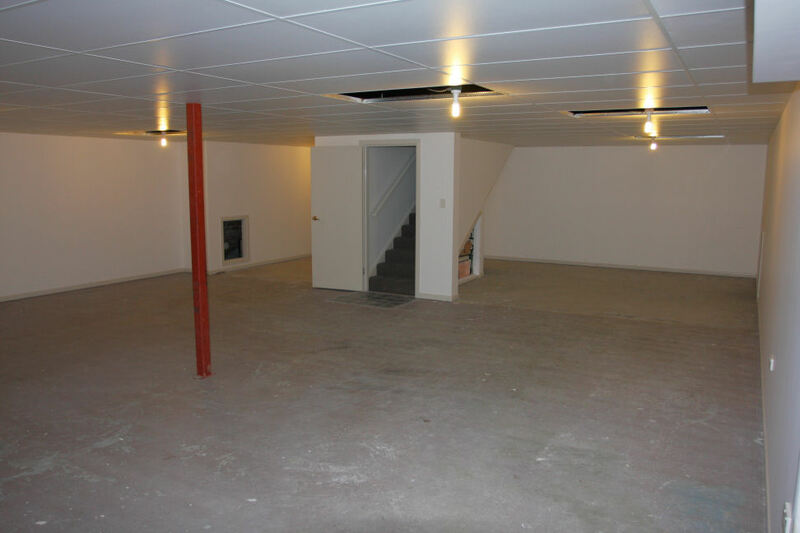 The next stage after the ceiling will be the flooring. I still haven’t made my mind up as to what I want to do here. I have been thinking of numerous ideas, each with their own pros and cons. 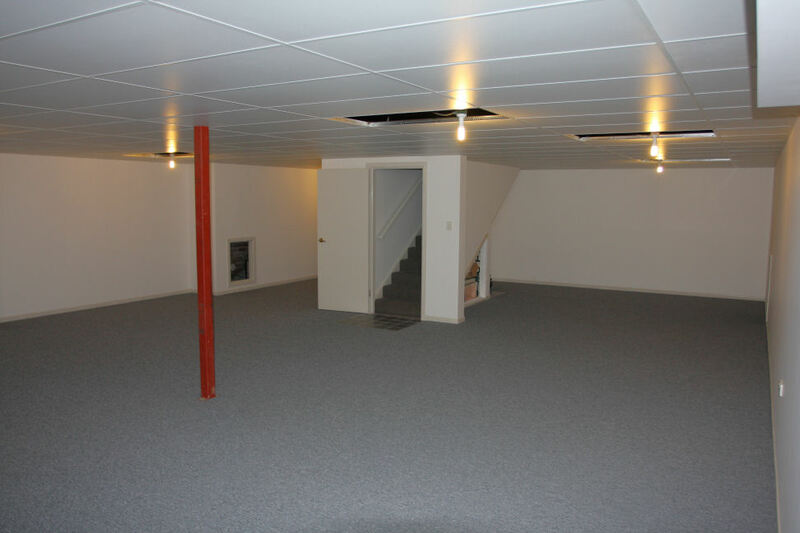 Floating timber floor?…..Carpet?…..Carpet tiles?…..Vinyl? Since the last post, I have completed nearly all the gyprocking, except for the section across the roller door and two of the brick sections. The roller door will be left for a while, as I need to get rid of some cupboards and shelving units that are now too tall and cannot fit in the room with the proposed layout plan. The roller door will be the easiest method of extricating these items, as once it is framed over, the only access will be up the stairs into the house, and I’m not dragging them up the stairs!! Hopefully over the next couple of weeks, I’ll complete the setting of all the joins and maybe even give the walls a coat of paint. This won’t be anything flash, as the walls won’t be seen once the layout get built. Then it will be time to get the workbench back in position ready for some long awaited modelling to recommence. 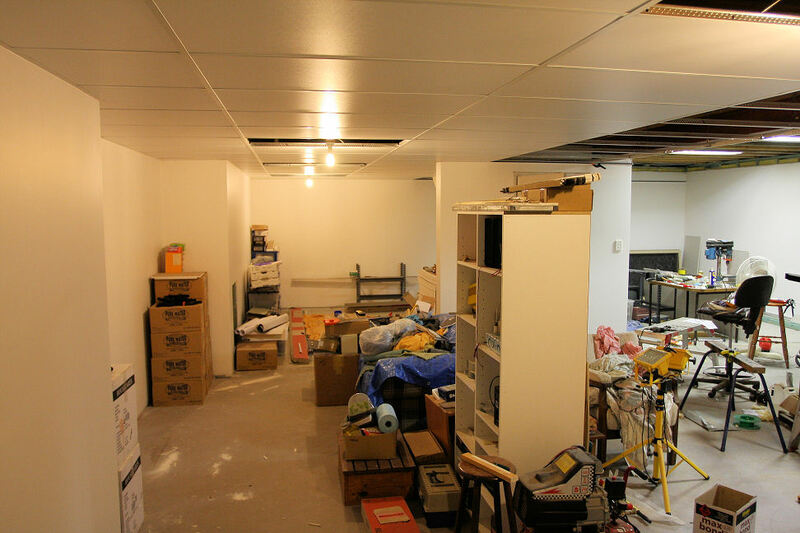 The next major job will be to install the suspended ceiling. Over the last few weeks I have been busy downstairs. The remainder of the timber wall frames have been completed, along with sarking installed behind the new section of timber frames on the retaining wall. The gyprock got delivered this afternoon. 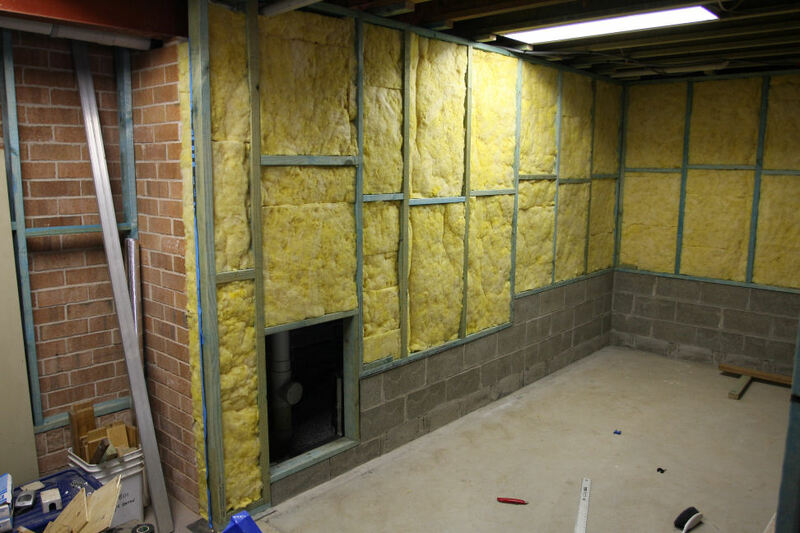 Today I installed the insulation batts in this same section. 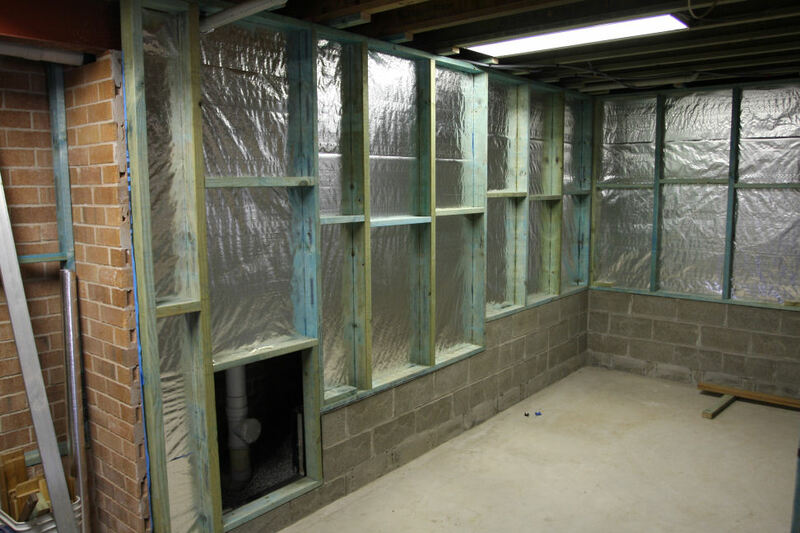 This is the only area where I will install the insulation as the rest of the walls are against the outside brick walls, and I don’t think insulation will be needed. Here are some shots before and after the installation of the batts. Will do another update next week when the gyprock goes up. Well, the deck extension is finally finished, and the Council Inspector gave the whole project the tick of approval, so it’s time to resume work on the important part – the train room!!! The builder cleared all of his tools out on Friday, and today was spent having a bit of a cleanup. The next thing to do is to continue building the wall frames for the rest of the room. 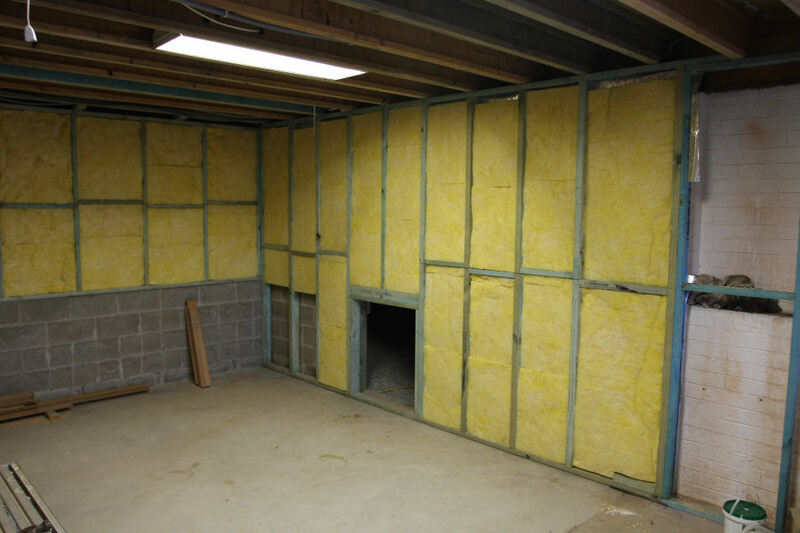 I may install the gyprock to the new section sooner rather than later to basically seal the room off from the underneath area of the house, although the room won’t really be sealed until I add the suspended ceiling. That’s about all for now, but will keep you updated as things progress. 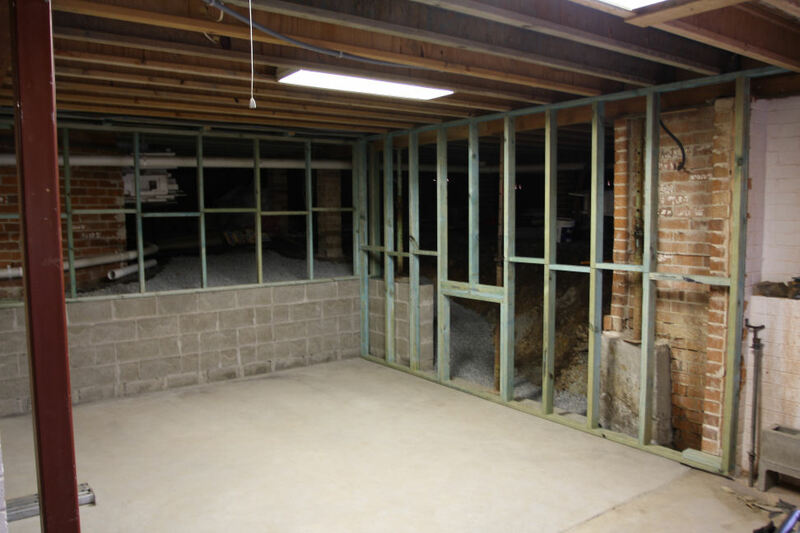 Well over the last two days, Thursday and Friday, the wall framing was completed in the new section of the room. The small opening you can probably see in the first picture is for a future access hole under the house. 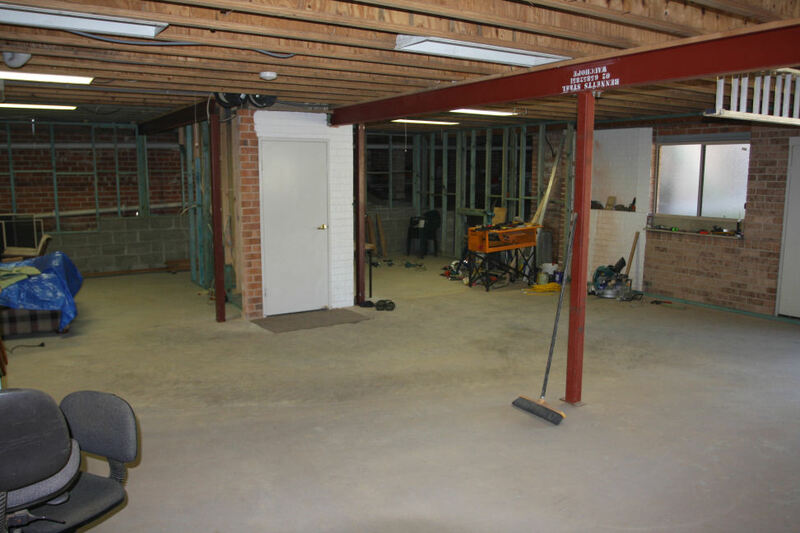 This will not be a main access point, but more for inspecting any drainage points and for pest inspections. A new proper access door to under the house will be cut into one of the external brick walls. 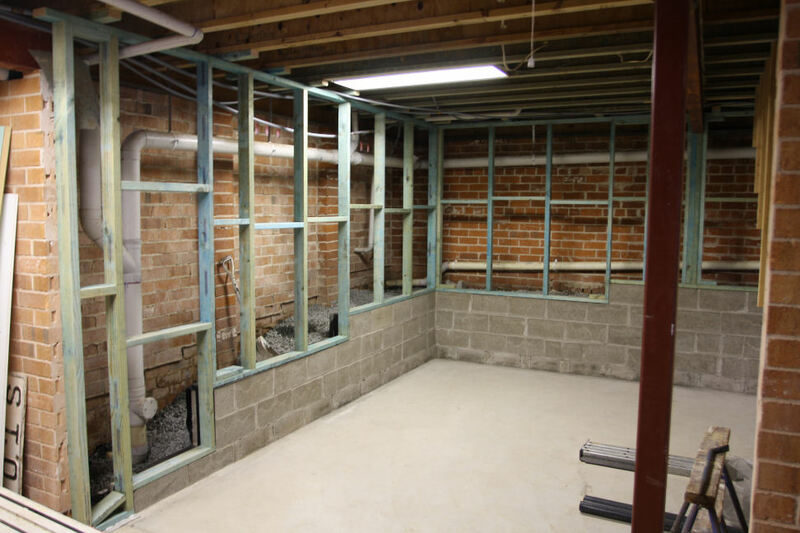 The other opening at the end of the block wall in the second picture is to allow access for an inspection point in the sewer line as well as access to a drain pit where the agline runs into. Both of these doors will be beneath the lowest section of the benchwork. 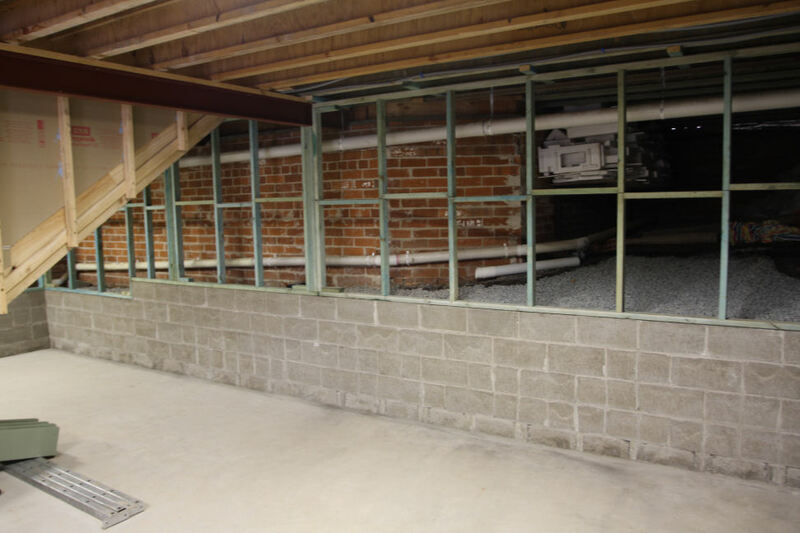 Both the left hand and right hand walls are load-bearing, and the only section of the rear wall which is load-bearing are the timbers under the steel beams. If the weather is fine next week, more work will resume on the new deck outside the house, so the next step in the layout room will probably be to install some sarking and insulation in the new walls prior to gyprocking.